Treehouse of Worship. Everyone loves a treehouse, especially one that dates from 1696 (built in a tree that’s over 800 years old, no less). 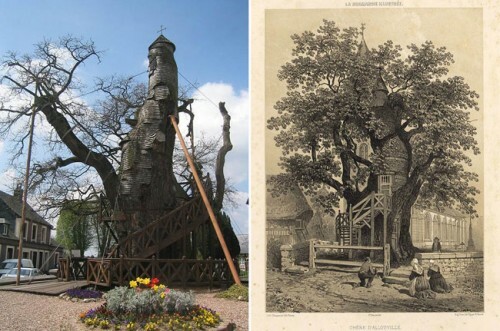 Boing Boing uncovered the chapel in Allouville-Bellefosse, France dedicated to the Virgin Mary that was built in the hollowed out trunk caused by a lightning strike. Talking Tanks. Who can forget the Mayor of Vilnius, Lithuania who, fed up with cars parked in the bike lane, crushed the offending vehicles with a tank. Classic. Transportation Nation couldn’t get enough of the car-crushing crusader, either, and has posted an interview where the mayor warns that tanks may return to the streets of Vilnius. Frank Llego Wright. Will we ever tire of LEGOs? I hope not. LEGO has already immortalized Wright’s Fallingwater and his Guggenheim Museum in tiny plastic bricks, but Building Design just reported that the Prairie-style Robie House in Chicago is also available for architects and aspirants to assemble and adore. Baking Buildings. Some of the most beautiful historic (and modern, too!) buildings feature terra cotta facades, but whether they’re ornate or sleek, we seldom have a chance to peek behind the scenes to see how the clay cladding is made. Buffalo Rising took a visit to a local terra cotta factory to check out what’s involved.